JON BERNTHAL JON BERNTHAL JON BERNTHAL. Introduction – Jake talks about his recent handyman accomplishment and I bring up two stories that explain what I’ve been doing with my life recently. [15:08] News – We discuss Jon Bernthal’s Punisher character and his research in the new upcoming season of Daredevil. We also want to help out our friend Mike, as mentioned on the show, so please click this link to donate to his GoFundMe page if you have the money to spare. [23:32] Mail Call – So much mail I can’t even write it all in! [27:02] Bullet Points – We cover Punisher #19. We weren’t fans of it, but respect differing opinions. Secret Wars Journal #3 is a fun noir romp, though! We round it out with Ultimate End #2-3. 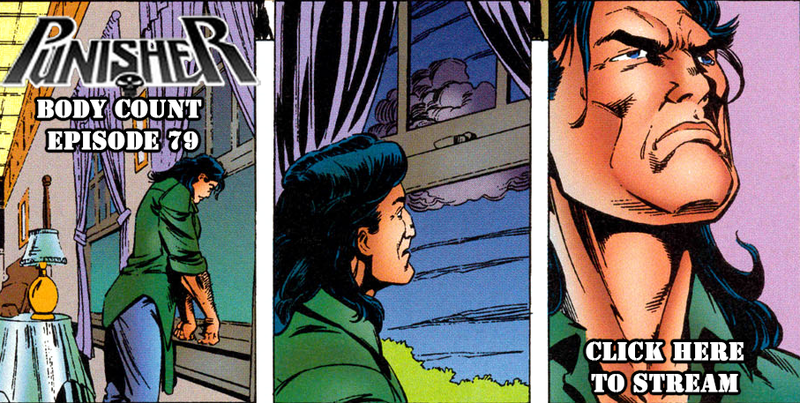 [1:05:37] Flashbacks – Today continue to remember John Ostrander’s Punisher #5-7. We get bad artwork, the return of Rosalie Carbone, and more! [1:40:12] Discharge Papers – We finally get around to talking about Terminator: Genysis. I recommend an Audible trial that our show is now affiliated with. If you click the link and get the trial, our show gets a cut of the money, which helps us pay the bills and get new multimedia segments! Jake also talks about his recent playtesting experiences and I recommend the movie Nightcrawler, now on Netflix.